The appendix is an organ thought to have gone the way of our wisdom teeth and body hair: At one point we all needed them, now people can get by just fine without them. 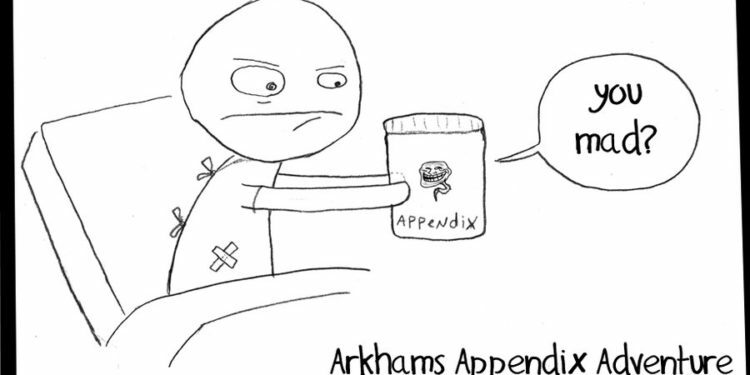 Scientists, though, have never been certain what the appendix used to do—and if it is still, in fact, useless. On Jan. 9, a team of researchers led by scientists at Midwestern University Arizona College of Osteopathic Medicine published (paywall) a review study proposing an answer: the appendix is a secondary immune function that both catalyzes immune cell responses and floods your gut with beneficial bacteria when they’ve been depleted. And it still plays that role, in a limited fashion, in human body function. Appendices are not unique to humans. Over the course of eight years or so, Heather Smith, an anatomist and lead author of the paper (who had her own appendix removed at the age of 12), led a team that examined all the available information on mammals with the organ. The total number of species came out to be 533, and included chimps, dogs, and even pikas. These animals are as different as could be: They hail from all parts of the world, eat different diets, and even travel in different types of social groups. Smith was looking for similarities among their various appendices that could explain what kind of purpose the organ could serve in humans. They thought that maybe, variation among appendices would be related to animals’ lifestyles. But no such luck: “We failed to find a link between appendix presence (or size) and the dietary, ecological, and social characters,” they wrote. But they did find a common immunity trait. “In animals that have an appendix, there is a higher concentration of lymphoid tissue in the cecum,” says Smith. The cecum is a part of the digestive tract that begins in the large intestine, from which the appendix stems. This lymphoid tissue, she thinks, is full of cells that trigger an immune reaction when the body is under duress. Additionally, their work supports evidence that the appendix is a reserve of emergency bacteria for when the rest of the gut is wiped clean. Our guts are populated with trillions of microbes (mostly bacteria), that live symbiotically with us. They get a cozy space to live with a constant food supply (both the food we eat and the nutritious mucosal lining coating our intestines), and in return they give us extra nutrients and crowd out infection-causing bacteria. When we take antibiotics or get food poisoning (or anything else that causes the intestines to rapidly evacuate their contents), our guts are completely flushed of all bacteria. “The appendix has a concentration of good gut bacteria that can repopulate the gut,” says Smith. Although they weren’t able to study the specific types of bacteria in each animal, this is a theory that has been described (paywall) in humans before. Although this work doesn’t catch the appendix in action, the fact that the appendix evolved separately in mammals 30 different times means its existence isn’t random, says Smith. “We can function okay without it, but the appendix does provide some degree of immunity and beneficial bacteria,” she says.